Why is it always assumed that sports of the future will involve weapons of some description? Is this the direction that professional sport appears to be taking? With the exception of soccer hooligans occasionally throwing sharpened pennies at players/referees/each other, and ice hockey players sometimes belting the sultanas out of members of the opposing team, it�s not very often that any kind of maiming/killing implements would appear to be called for in order to win the game. Then again, George Orwell predicted that by 1984 we would all be running around trying to dodge Big Brother and the Thought Police, and no-one makes a big issue of him getting it slightly wrong, so perhaps it�s time for a little suspension of disbelief in the name of entertainment. 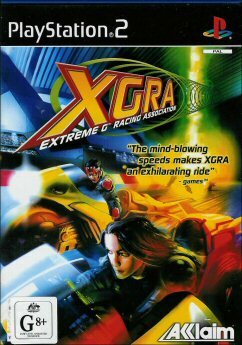 Extreme Gravity Racing Association, or XGRA, is a futuristic racer that involves players riding super-powerful bikes equipped with an arsenal of deadly weaponry around a selection of twisting, neon-lit tracks. And when we say powerful, we�re not talking about the latest 500cc Kawasaki road bike. We�re talking sound-barrier-breaking, organs-turning-to-mush, space-shuttle-takeoff powerful. 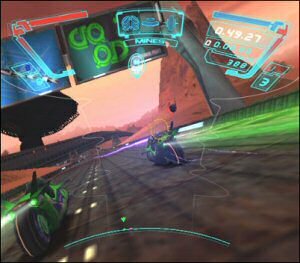 The main component of the game is the Season mode, which involves racing for a team over a series of leagues, which, unsurprisingly, become more and more difficult as you progress. Players start with a bog-standard bike, with more models being unlocked as more races are won. 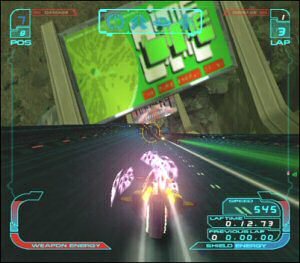 Similarly, you�ll ride your first few races completely unable to use any weapons, with a veritable arsenal becoming available as you progress through the game. Great care seems to have been taken by the developers to present XGRA in a real TV style, right down to the lengthy write-up about the racing association in the manual. The commentator at the beginning of each race is often quite funny as he gives players an overview of the track, and it�s clear that the presentation has been designed with tongue firmly placed in cheek. Which, overall, is quite endearing. Another nice touch is the rivalry between the player and the numerous computer riders. Nail an opponent with a missile and a little video-link box will open in your screen as he/she mocks/threatens/abuses you. Obviously the aim here was to provide a more immersive experience, and it works quite well. At the end of the day, however, XGRA is a racer, and its playability will succeed or fail on the strength of the racing action. So how is it, you ask? The answer is: good, but not great. One of the most important issues at stake is obviously the sense of speed. In this regard, XGRA delivers very well. It is, at times, blindingly fast, particularly when driving over the �boost� areas of the track. Races become very hectic, which is good, with all kinds of weapons being dropped/shot at other riders, and explosions rocking the track with alarming regularity. 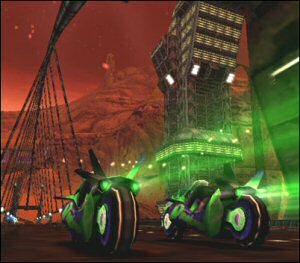 On the downside, the game does tend to slow down quite a bit, which is never good and is particularly undesirable in a racer of this type. Controls are nice and responsive, although the default controller setup seems a little bit weird, using shoulder buttons to accelerate/brake and the facia buttons for weapons and such. Luckily there is an alternative configuration which is far more like the traditional racing game controls that players will be used to, so it�s all good. The bikes seem to be slightly twitchy in the steering department, and it�s very easy to find yourself bouncing from wall to wall for the first few races until you grow used to the sensitivity and learn to steer properly. The track design is quite inspired and very well thought out, and some of the courses are really rather spectacular. Not that you�ll notice much of your surroundings as you whiz by at 600km per hour, but it�s nice for anyone who�s watching you while they wait for a turn. Jumps, loops, and corkscrews all make a welcome appearance and there are plenty of obstacles to keep you on your toes. XGRA should keep you going for a fair while, with five different leagues to play through before the season finishes. In addition to winning the race, players need to complete secondary objectives to keep their sponsors happy. These challenges offer a little bit of variety to the races, but ultimately seem rather pointless. Apart from climbing through the leagues, however, there�s not much on offer here. Just a time trial mode and a pretty naff two player game, which is unfortunate. Graphically, XGRA is very nice, with the tracks having a lovely futuristic look to them. The slowdown mentioned earlier is rather unfortunate; it would have been nice if the framerate could have been kept a little higher overall too. As mentioned before, the sense of speed is generally pretty good, which is really the most important thing here, and there are plenty of beautiful weaponry effects on offer that make use of the PS2�s lighting capabilities. This title actually features 2 different soundtracks, a rock track and a techno track, so you can take your pick depending on your preference. This is a nice idea, because I�m sure plenty of players don�t want to HAVE to listen to techno just because they�re playing a futuristic game, so the twin soundtrack idea offers more scope for everyone to appreciate it. The sound effects are pretty sweet too, but some of the voice acting is a little bit dire. If you�re a fan of futuristic racers, then XGRA is certainly worth investigating. It�s a pretty solid game let down slightly by twitchy controls and some mild framerate issues, but overall is very playable and a fairly good way to while away your time. Worth a look.